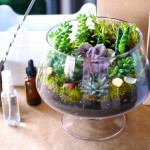 Juicykits.com is dedicated to do-it-yourself terrarium kits that house beautiful succulents and air plants. Our products make unique, memorable gifts and part of each purchase from our store goes to charity: water to help bring clean drinking water to people in need. Our DIY terrarium kits are super easy to assemble because we’ve pre-measured and included everything you need. You just choose your plants and get creative. We started Juicykits.com because we wanted people to have a great time creating these beautiful, living works of art without having to drive all over town buying all the materials. We believe that sometimes, it doesn’t take much to make a big difference. We love succulents and air plants because they require so little water and care but provide such a broad variety of beautiful greenery to our space. Our terrarium kits have subtle, thoughtful design aesthetics that will compliment any home or office. Press Peeps! We have a beautiful press kit and great sample products. Contact Us! Just a bit of green can add a lot to your space and your life. Just a bit of water is all you need to keep a beautiful desert ecosystem thriving. Just a bit of charity can bring safe drinking water to people in need. Well, you could spend a lot of money on a pre-made terrarium or buy a cheap one from the mall that dies in a couple of weeks. But our kits make it easy for you to create something that you’re proud of, to give a truly personal gift that lasts, and to enjoy a little bit of nature just like the good ol’ days. 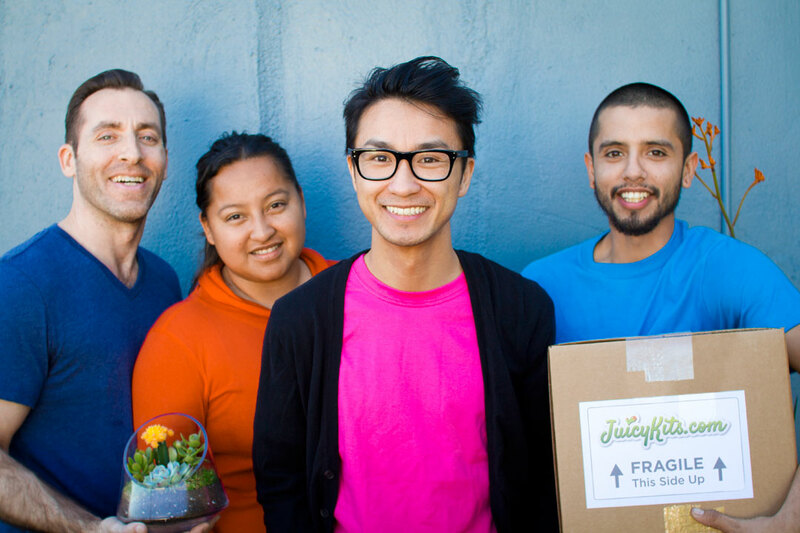 Juicy Kits are easy 45-minute projects, they don’t take hours or days to put together. And they’re so easy to care for you’ll forget that you weren’t born with green thumbs. What’s in a kit? We’re in love with succulents! They come in an endless variety of shapes, sizes and colors and they’re so easy to care for (or hard to kill). We’re always delighted when we see a new variety at our growers’ facilities. 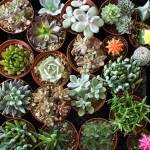 Succulents and cacti are drought-resistant plants that need very little water and lots of light. Air plants are similar but they don’t even need soil! We pick up and ship our plants when you order them, so they arrive fresh and ready to be repotted. View our Succulents Menu. Your purchase makes a difference. We donate 2% of all our proceeds to a lovely charity called charity: water. charity: water is a non-profit organization bringing clean, safe drinking water to people in developing countries. They use 100% of public donations to directly fund sustainable water solutions in areas of greatest need. Just $20 can give one person access to clean water. Visit charity: water. If you have questions about our store or products, please take a look at the FAQ’s & Store Policies. Or get in touch if you need anything else.